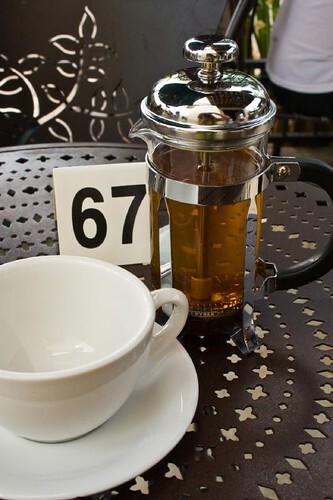 While spending a week in Venice, California I had tea and toast in my cozy cottage most mornings or sometimes ventured out to local coffee shops or farmers’ markets for a little bite. One morning, though, I decided to have a real sit-down breakfast at a place M had told me about, Urth Caffe (pronounced “earth”). Urth has three locations in the LA area with one in Santa Monica on Main Street. That one was within walking distance of my cottage – perfect! Urth bills itself mostly as a coffee and tea shop but they also have a fairly significant menu that can be ordered in or to go. I was there on a weekday morning and the line was out the door. Many people were taking items to go so after placing my order at the counter I was able to find a little table out on the small patio. The patio is very pleasant with plants breaking the direct sun and a corner fountain babbling just enough to reduce the traffic noise. 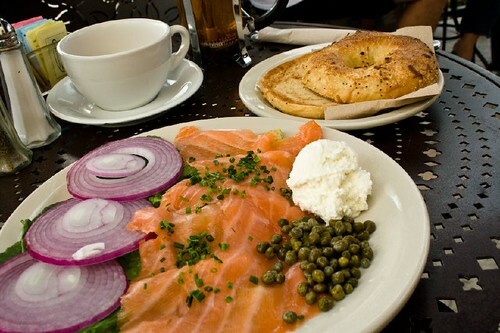 Many items on the menu caught my eye but I settled on the smoked salmon and bagel plate, as well as a pot of tea. The tea was served in a French press, which is kind of nice but can lead to tea that is bitter since there is no way to remove the leaves when it’s done brewing. I just made sure to drink my pot fairly quickly so I wouldn’t have to worry about it. I do like the presentation but it’s just not that practical. My breakfast arrived a couple minutes after my tea and was absolutely gorgeous and very generous. 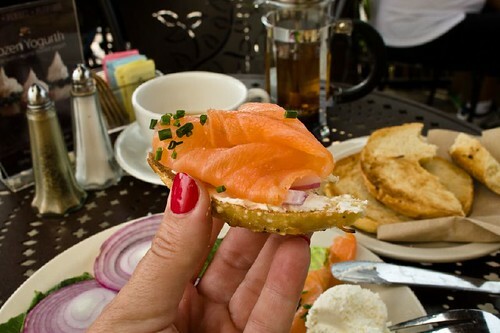 The salmon was a lox style preparation and was super fresh. It was accompanied by lots of red onion, soft cream cheese, capers and a nice sprinkling of chives. I’d chosen an onion bagel to go along with it and while not exactly an east coast bagel it was good. I spent the next half an hour or so, soaking in the sights and sounds of the people around me and the passing pedestrians, and enjoying the perfect combination of ingredients in each and every bite. Urth is very pleasant and the food (including all that I saw around me) was very good. I’d love to go back again the next time I’m in the area. I imagine it’s just a zoo on weekend mornings but definitely manageable on weekdays.